The draw to determine the groups for the UEFA Euro 1992 qualifying cycle took place on 2 February, 1990 in Stockholm. By that point the Berlin wall had already come down and West German chancellor Helmut Kohl had announced a 10-point program aimed at increased cooperation between the FRG (Federal Republic of Germany, or West Germany) and the GDR (German Democratic Republic, or East Germany) with an ultimate aim of reunification. But reunification had not yet been formalized, and thus the East German national team participated in the draw. Sensationally, they were drawn with West Germany in Group 5, along with Belgium, Wales, and Luxembourg. But before the qualifiers even began, the End of History interfered. Prior to 1992 the head-to-head record between two national teams of East and West Germany was one sided, as one would imagine. But, surprisingly, one sided in favour of the East Germans. At the 1972 Olympics East defeated West 3-2 in a second round match in Munich and ended up sharing the bronze medal with the Soviet Union. Two years later they met again on a more visible and prestigious stage: the World Cup. And once again the match took place in West Germany, this time in Hamburg. In a result that no one expected, East Germany beat their estranged compatriots 1-0, a victory that was politically exploited by East German propagandists. But these results were an anomaly and not even remotely representative of the footballing balance of power between the two countries. East Germany may have won the match and the group at the World Cup, but it was West Germany captain Franz Beckenbauer who lifted the Cup in Munich a fortnight later. Admittedly East German clubs did achieve modest success on the European stage. 1. FC Magdeburg defeated AC Milan in the 1974 Cup Winners’ Cup Final and Carl Zeiss Jena narrowly lost to Dinamo Tbilisi in the final of the same competition seven years later. But the integrity of the DDR-Oberliga was shattered when the Stasi decided that the club under their patronage, FC Dynamo Berlin, should dominate the East German football league from there on out. After Dynamo Dresden clinched the league title in 1978, Minister of State Security and chief of the Stasi Erich Mielke allegedly paid a visit to Dresden’s dressing room and informed that it was now Berlin’s turn to win. Dynamo Berlin, derisively labeled the elf Schweine (eleven pigs), proceeded to win the next ten titles without even attempting to maintain any semblance of fairness. The biased refereeing was so obvious that the press, public officials, and even fans – average home attendance at matches fell from 15,000 to 5,500 through the 80s – publicly voiced their disapproval, but to no avail. Considering the blatant match-fixing and complete lack of competitiveness in the Oberliga, it is not surprising that many East German football supporters looked instead to the other side of the Iron Curtain. Television, and along with it access to Western channels, made it relatively easy for the dedicated fan to follow a Bundesliga club instead of suffering through the futility of supporting a local side. Overly enthusiastic support, however, could draw the attention of the Stasi. In Football Against the Enemy Simon Kuper recounts the story of Helmut Klopsfleisch, a resident of East Berlin who at every opportunity traveled to Eastern Bloc countries to back “any Western side against any Eastern side.” Especially if the Western side happened to be his beloved Hertha Berlin, from which he was exiled by the Berlin wall. Klopsfleisch was so fanatic in his support that the Stasi had an entire file on him, and in 1989 he was even permitted to emigrate to the West, a testament to just how much of a thorn in the side of the East German authorities he had been. The fact that Klopsfleisch was allowed to emigrate was a clear sign that the times were changing. In May of 1989 Hungary removed its border fence and hundreds of East Germans on holiday took advantage of the opportunity and escaped to Austria. The iron curtain had been breached. After months of protests, the Berlin wall finally fell on November 1989. But the collapse of the wall was not synonymous with reunification, as the constitutional process to absorb the GDR into the FRG would take almost a year. So with East Germany still legally a sovereign state, its national team continued to participate in official competitions. In the league, meanwhile, Dynamo Berlin’s monopoly on the championship was finally broken in 1988-89, as Dynamo Dresden regained their title eleven years after the Stasi had decided that their time was up. But the influence and power of the Stasi was waning, and they could no longer fix matches and intimidate referees with such impunity. Sensing that the tide was turning, Dynamo Berlin changed their name to FC Berlin during the 1989-90 season. FC Karl-Marx-Stadt followed suit and became Chemnitzer FC the following year. 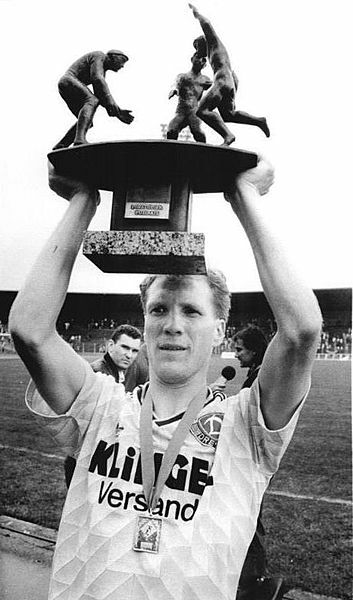 Dresden defended their title in 1990, but the next season was declared to be the last one of the DDR-Oberliga. The top two finishers in the 1990-91 campaign would be granted entry into the Bundesliga the following season. Hansa Rostock won their first ever East German title and were joined in the Bundesliga by runners up Dynamo Dresden. 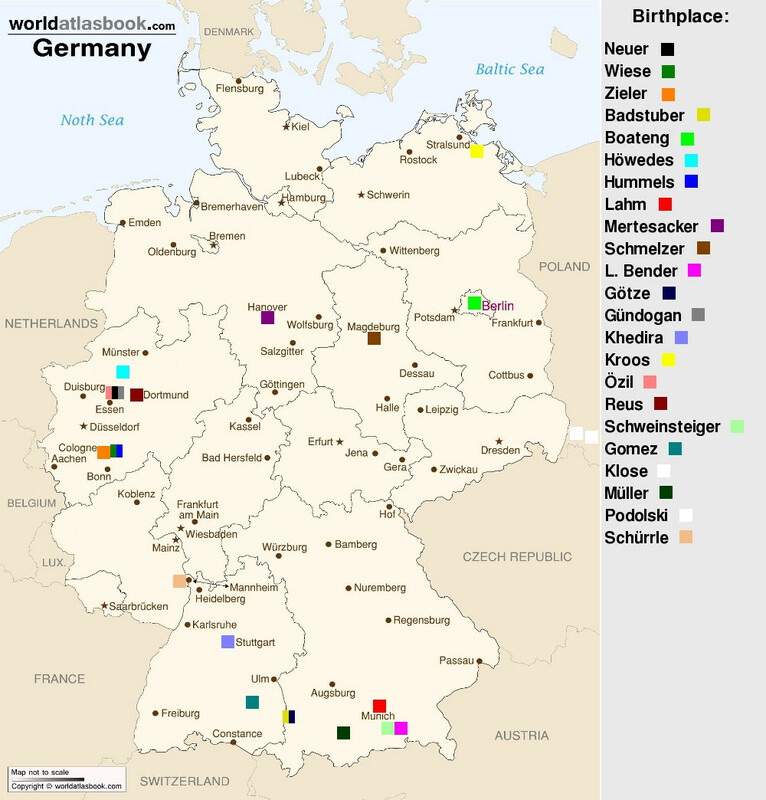 The late 80s were the closest East German football ever got to a ‘Golden Generation.’ At the 1987 FIFA World Youth Championships in Chile (now known as the FIFA Under-20 World Cup) the East Germans, led by the likes of Matthias Sammer and Rico Steinmann, won their group and defeated Bulgaria 2-0 in the quarterfinals. They were narrowly defeated by eventual champions Yugoslavia in the semifinals, but then beat the hosts on penalties to take 3rd place. Then, during the tail end of the qualifiers for the 1990 World Cup, the senior side came back from behind to defeat the Soviet Union 2-1 and set up a final match against Austria where all they needed was a win to qualify. But it was not to be. Just one week before the match the wall came down. 4,000 East German fans traveled to Vienna for the match, though it is unclear how many of them actually came to support their national team and how many were simply taking advantage of the sudden loosening of travel restrictions. The East German players had barely arrived at their hotel when “they were swamped by agents, scouts and managers from Bundesliga sides” who sensed an opportunity to poach talent from the GDR. Whether this sudden attention had any effect on the players is unknown, but they lost 3-0, ruining any chances of a second World Cup appearance. Before long Sammer, Steinmann, and Andreas Thom were all swept up by Bundesliga clubs. West Germany, meanwhile, qualified easily and after breezing through the group stage they defeated the Netherlands, Czechoslovakia, and England to set up a final against defending champions Argentina. Many Ossis, as East German residents were commonly called, openly supported the West German side, no longer fearful of arousing the suspicions of the Stasi. In a memorable scene from the German film Good Bye, Lenin! an Ossi is desperate to get a satellite dish set up it time to watch the semifinal against England. Frustrated by the lack of progress, he storms off to his neighbour’s flat instead. The final, an incredibly dour match, was decided by a controversial 85th minute penalty dispatched by Andreas Brehme. On paper, this was West Germany’s third World Cup. But in reality this World Cup belonged to all the German people, Wessis and Ossis, separated for 44 years by a barrier both literal and figurative. It wasn’t quite Das Wunder von Bern, but it was certainly a seminal event that has gained a spot in German football lore, more for its symbolic value than for the performance on the pitch. So what, then, became of the East German national team? Though the lengthy legal reunification process was well underway by the beginning of 1990, the GDR remained a nominally sovereign state and thus its national team continued to play international matches. Their first match after the 3-0 loss to Austria was a defeat to a Cantona-inspired France side by the same scoreline in a friendly tournament in Kuwait. But that result would prove to be the last loss the East German national team ever suffered on the pitch. They beat Kuwait 2-1 in the final match of the tournament and then on April 1 defeated the United States 3-2 at the Berlin Sportforum, the ground of Dynamo Berlin, in a match devoid of the political undertones that surely would have clouded it had it taken place even a year earlier. A week later Egypt was beaten 2-0 at the Ernst-Thälmann-Stadium in Karl-Marx-Stadt. By the summer Karl-Marx-Stadt reverted to its former name of Chemnitz and the Ernst-Thälmann-Stadium, named after a communist leader active during the Weimar Republic, was renamed Sportforum Chemnitz. The matches against the USA and Egypt were the last ever that the GDR national team played at home. But interest in the national team had long been waning. In the 70s East Germany regularly drew crowds in the tens of thousands to their matches, including an astounding 100,000 that packed into the Leipzig Central Stadium in 1971 to witness the home team lose 2-1 to Yugoslavia in a Euro 1972 qualifier. But by the late 1980s the national team struggled to fill the stadiums. Only 16,000 fans saw the GDR register an impressive victory over the USSR in a 1990 World Cup qualifier. At the last two home matches attendance was pitiful. Only 4,000 showed up for the friendly against the USA; barely 1,000 saw East Germany’s last ever home match. In May East Germany was invited to play a friendly at the Maracanã in Rio de Janeiro for what would be a World Cup tune-up for the Brazilians. The host nation paid for the flights and accommodations of their visitors, who came back from 3-1 down to claim an impressive draw. The friendly against Brazil took place on 13 May. Five days later West German Chancellor Helmut Kohl signed a social and economic unification treaty with his East German counterpart Sabine Bergmann-Pohl. But the Euro 92 qualifiers had already been scheduled. East Germany was supposed to start their qualifying campaign away to Belgium on September 12. As reunification was imminent. the match was reclassified as a friendly. In the last match that the East German national team ever played, they defeated Belgium 2-0 in Anderlecht. Captain Matthias Sammer scored both goals. Fittingly, Sammer was already playing for Bundesliga club VfB Stuttgart. On October 3 the German Democratic Republic officially ceased to exist. 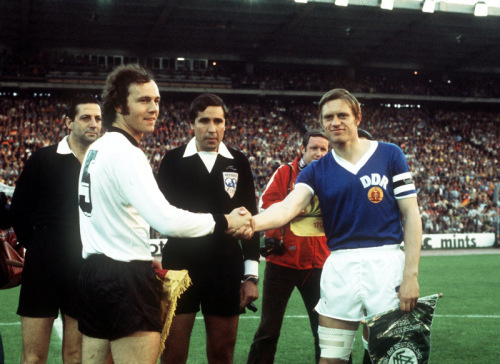 The match between East and West Germany was scheduled for 21 November in Leipzig, but by that time the former had been incorporated into the latter. Instead, the footballing authorities decided to make the fixture a ‘friendship match’ to celebrate reunification, not entirely unlike the ‘friendship match’ that took place between Germany and Austria after the Anschluss. Matthias Sammer already had his sights on a spot on the West German squad team for Euro 1992, but he promised his teammates that he would turn out one last time for East Germany. The match never took place. Hooliganism and skinhead culture had emerged in the stadiums of the Oberliga in the 1980s and by the end of the decade had become a widespread phenomenon. Anti-Semitic and neo-Nazi chants were a common occurrence. By the late 80s arrests related to football had reached 1,000. In a particularly nasty incident hundreds of skinheads marched through Berlin before the 1998 FDGB-Pokal final, then chanted neo-Nazi slogans throughout the match. The West German authorities, fearing for the safety of the players, called off the match. The East German national team, like the country, ceased to exist. Its history ended not with a bang, but with a whimper, a bureaucratic decision made in response to hooliganism. Matthias Sammer received his call up and was included in the [no longer West] German squad for Euro 92, along with fellow Ossis Thomas Doll and Andreas Thom. Sammer went on to become one of the best German players of his generation. He became a European Championship winner in 1996, starting every single match en route to a 2-1 victory over the Czech Republic in the final. He was named Player of the Tournament and the following year added a Ballon d’Or to his impressive trophy haul after captaining Borussia Dortmund to Champions League glory. But Sammer’s successful career is hardly a typical experience of an East German player in a united Germany. Twenty two years removed from reunification, the gulf between West and East German football remains vast. East German clubs were ill-equipped for the transition to a market economy. Their best players were quickly sold off to Western clubs. Corruption was rampant, as club officials were eager to line their own pockets rather that reinvest in their squads. Dynamo Dresden were fought against relegation battles for the entirety of their brief stay in the Bundesliga and finally succumbed to their fate in the 1994-95 season. But by then they were so far in debt that they were denied a license for the 2. Bundesliga and were demoted to the 4th tier Regionalliga Nord. They have not made it back to the Bundesliga since. Dynamo Berlin, meanwhile, currently compete in the fifth tier, drawing crowds of 900 die-hards. Other than Dynamo Dresden the only former Eastern clubs who have played in the Bundesliga are Hansa Rostock, Energie Cottbus, and VfB Leipzig. Of those three the most successful has been Hansa, finishing 6th twice. Energie Cottbus has never finished higher than 13th, while Leipzig finished dead last in their only top flight appearance. In 2004 Leipzig, the first champions of German football, went bankrupt. They have since been resurrected by a group of dedicated fans as 1. FC Lokomotive Leipzig, reverting to the name used during the socialist era. Red Bull Leipzig are now the big boys in town. The footballing disparity between East and West remains massive. As Uli Hesse writes in Tor! “the former GDR was quickly becoming a barren footballing wasteland instead of the ‘blooming landscape’ Chancellor Kohl had promised.” Many grounds remain decrepit, racism is rampant, and attendance figures are poor. The divide is visible when looking at the national team as well: at Euro 2012 just two of the squad were born in the former East Germany: Toni Kroos and Marcel Schmelzer. Part 3: Collapse and Invention, will be published shortly. Tor! The Story of German Football by Uli Hesse is the preeminent history of German football. Ostklassiker , a fantastic blog about East German football run by @valedave. This article was used as source material, but everything on there is well worth your time. The Ball is Round: A Global History of Football by David Goldblatt is, as always, an invaluable text when it comes to the history of the beautiful game. Special thanks to John Fisher for his help in translating several German language articles that were used as source material for this piece.